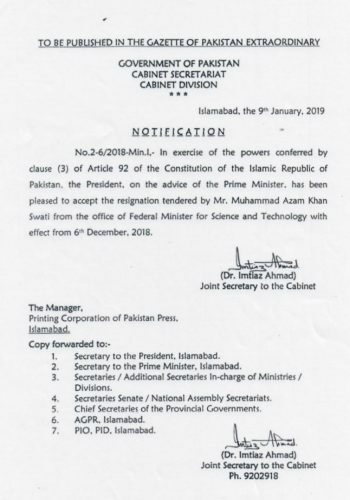 ISLAMABAD (92 News) – The federal government on Thursday accepted the resignation of Azam Swati as federal minister for Science and Technology. The notification related to approval of the Azam Swati’s resignation issued on January 9 after a month. According to the notification, President Dr Arif Alvi approved the Swati’s resignation on recommendation of the prime minister. The notification further stated that the resignation has been accepted with effect from December 6, 2018. After the resignation of Azam Swati, his name was included in the cabinet list as federal minister. This matter was discussed in the hearing of IG Islamabad transfer case in the Supreme Court. Hearing the Islamabad IGP transfer case yesterday, Chief Justice of Pakistan Mian Saqib Nisar remarked that former minister Azam Swati was counting days for his departure. The chief justice referred the issue of Azam Swati to the departments concerned. On December 6, Prime Minister Imran Khan accepted the resignation of Pakistan Tehreek-e-Insaf (PTI) Senator Azam Swati from the post of federal minister for science and technology. On December 5, the chief justice has remarked that the Supreme Court will try Federal Minister for Science and Technology Azam Swati under Article 62(1)(f) of the Constitution.